The first thing I thought when I read about Unusual Suspects was that it seemed like it would play like a cooperative version of a game I like called NOIR. Well, even though that’s not what it is, that intrigued me enough to give it a try. This Unusual Suspects review is based on ~10 plays. 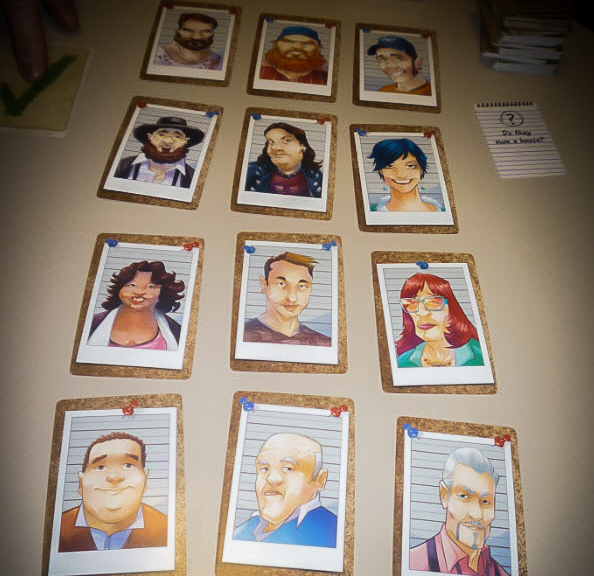 Unusual Suspects is a cooperative party game in which you play as detectives working together to try to catch a thief. You’ll do this by questioning a witness who only remembers the thief’s habits and not what they look like. 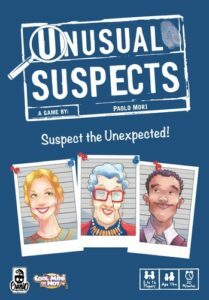 Unusual Suspects was designed by Paolo Mori (Libertalia, Ethnos) and published by CMON Limited. Each game of Unusual Suspects begins by choosing one player to be the witness. Then you’ll set up 12 Suspect Cards in a 3×4 grid in the middle of the table. After shuffling up the Question Cards, you’re ready to go! Throughout the game, the witness will be answering questions from the Question Card deck. When they’re asked a question, they will simply flip over the “yes” or “no” card to show whether or not that question describes the thief. After the witness answers a question, everyone else will work together to eliminate suspects based on the witness’ answer. For example, if the witness answers no to “Do they enjoy cooking?”, then the detectives will want to flip over as many suspects as possible who they think do enjoy cooking. If the thief’s card is flipped over, everyone loses. Otherwise, you’ll fill out the Investigation Pad by writing down how many suspects you’ve ruled out that round. You’ll want to eliminate as many suspects as you can early in the game since the multiplier goes up each round. For example, in the third round, you’ll multiply the amount of suspects you’ve eliminated that round by three. That number you get for each round represents the amount of time you’ve spent trying to find the thief. Your goal is to spend the least amount of time possible trying to catch the thief, though there is no “winning score.” This is basically a “beat your past scores” type of game. Unusual Suspects ranks up there as one of the easiest games to learn how to play. You can teach most people how to play this one in less than two minutes. When played with the right group, this game can create some hilarious moments. Sometimes the witness player will think the thief could be described one way while everyone else sees it the other way, which results in a loss and some laughs. There’s plenty of replay value in the box. With 70 suspects and over 100 questions, you can play this one plenty of times without seeing too many similar setups. It plays very well at higher player counts. Actually, the more people you have playing, the better the game is since everyone will have their own opinions of why suspects should or shouldn’t be flipped over. And, of course, there’s more cheering when you figure out who the thief is. We didn’t have this problem, but some groups might not like the idea of judging people by their looks alone. It really is a game of stereotyping the 12 suspects, which can create some awkward moments if you play this game with strangers. If the detectives are watching the witness closely, they could figure out who the thief is by watching his/her eyes. We got around this by having the witness look at all of the cards every round so they weren’t fixating on one part of the grid. I was a huge Guess Who fan when I was a kid, and Unusual Suspects is kind of like a cooperative version of that game for adults. It’s not necessarily our favorite co-op party game (that would be Dungeon Fighter), but it’s a great 10-minute filler when we’re in the mood for a quick deduction game. If you don’t like the idea of judging the suspects purely by the way they look, then definitely avoid this one. Otherwise, you’ll probably like having Unusual Suspects on your shelf when you want a quick party game that has the potential to create a lot of laughs. Thanks for taking the time to read our Unusual Suspects review!